Some names are synonymous with greatness: Ali, Elway, Jordan — and in the fierce Indian- Country-basketball-world –LaPlante. Orville LaPlante. The 76-year old basketball legend from White Horse is known for not only his athleticism on the court, but his love of life and adventure. For years, LaPlante has coordinated and led wagon train rides from his ranch on Cheyenne River. 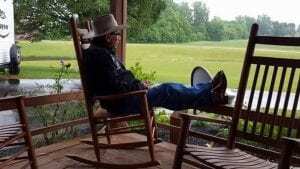 He is known for his horseback riding skills, and even has a popular Facebook page named “Orville LaPlante Photography”, which showcases rodeo photos that he took in the 1970s. He has shared his love for basketball through coaching youth teams. Orville smiled as he reminisced and told stories about students he coached. “It’s amazing to see them all grown up. They all did good,” said LaPlante. For many years, LaPlante has participated in the South Dakota Senior Olympics, consistently placing in free throw and basketball events. 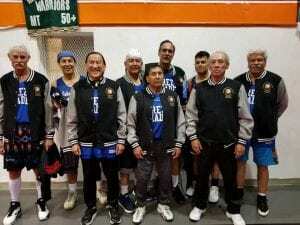 For the past 34 years, Orville has participated in the Fort Hall All-Indian “Legends Classic” basketball tournament, and has played in the 40, 50, 60, and 65 age categories. For the many years he has participated and shone in the tournament, Orville was honored by event organizers and recognized as a legend. His team, Rez Made, has won the championship title 11 of the past 12 years. This year, for the first time in 34 years, Orville will not be participating in the tournament because of a recent cancer diagnosis. “I start chemo next week. I will not be able to play,” said Orville. Holding his walking cane, Orville talked about a photo and the friends in the picture. “There is a photo from 1987 of me and my basketball friends. I am the only survivor left of that group,” said Orville. Orville said it is his hope that younger men of Cheyenne River stay active, maintain a healthy lifestyle, and serve as role models for the next generation. Despite the massive challenge that lay ahead of him, Orville continues his positive outlook and sheer determination to continue living his life in the healthiest way possible. He looks up and smiles. “I am confident and motivated that I will be back to the way I was. As soon as I’m healed up, I’ll be back to running and everything. Get ready for next year,” Orville said. Orville LaPlante kicks up his feet and reflects on a life filled with adventure and happiness. Orville is ready to take on his next challenge: overcoming cancer and retaining his healthy lifestyle.